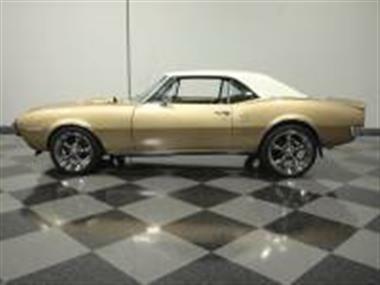 1967 Pontiac Firebird in Lithia Springs, GA for sale. 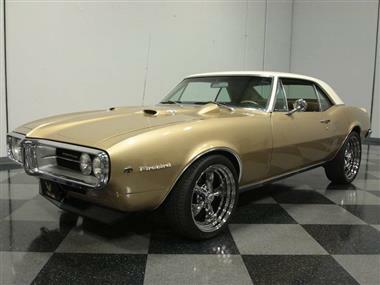 For the moneyand#44; this might just be the finest 1967 Pontiac Firebird you can buy anywhere. The restoration is only just north of 1and#44;000 miles oldand#44; the car is heavily optionedand#44; and with a unique color combination and a thumping 400 cubic inch V8and#44; its as attractive as it is potentand#44; making for a hobby car that does everything well.<br /> <br /> Pontiac was especially good at making even their pony car look like it was made for adults. 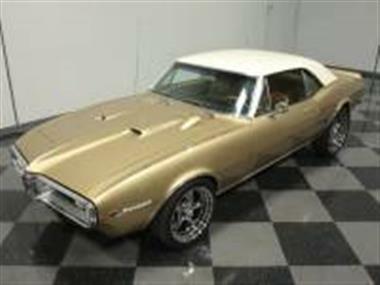 This lovely Firebird has all the performance styling cuesand#44; ranging from the hood scoops to the ducktail spoiler out backand#44; but the wonderfully subtle Montego Cream over Signet Gold color combination makes it look eminently tasteful. That is the cars original color combination and it was completely disassembled and stripped bare for the paint job. The result is a beautifully done car that sparkles in the sunlight and looks crisply rendered from any angle. It was finished about five years agoand#44; so there are some veryand#44; very minor signs of useand#44; but you can tell that this was an expensive makeoverand#44; not a quickieand#44; and the car shows all the better for it. 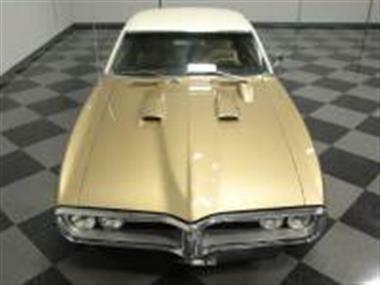 Youll also find that they spent the long dollar on the chrome and stainless trimand#44; as everything from the unique front bumper and grille assembly to the slender slotted taillights remains in excellent condition. 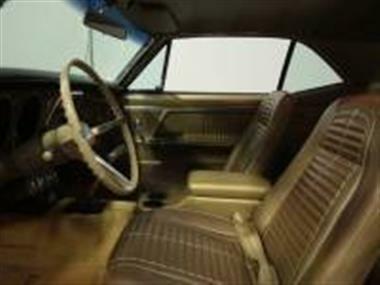 Fit and finish are quite good and you cant argue with just how right these early F-bodies look.<br /> <br /> The interior is beautifully rendered as welland#44; using correct materials and patterns throughout. It appears that the door panels and maybe even the seats are original-issueand#44; and if thats the caseand#44; theyre in spectacular condition. The carpets have been replaced along the way and show only light wearand#44; having been protected by a set of matching Firebird-logo mats. The factory gauges are bright and crispand#44; including the fully functional hood-mounted tachometer and a trio of auxiliary gauges standing on the transmission tunnel just under the center dash. That Hurst T-handle shifter is a period-correct accessoryand#44; but now it manages a Tremec 3550 5-speed manual gearbox that makes this car an absolute joy to drive. Theres also a digital AM/FM stereo radio in the dash and yesand#44; this is a factory A/C and the needs only a quick shot of R134a to be fully functional. 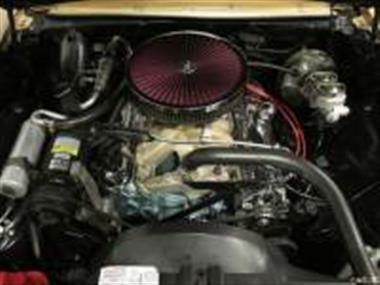 An aftermarket center console adds a pair of handy cup holders and the trunk is correctly detailed with a reproduction mat and a space saver spare.<br /> <br /> Pontiac didnt do matching numbers in the traditional senseand#44; but we have every reason to believe that the 400 cubic inch V8 under the pointed hood is original to this car. It was fully rebuilt in April 2015 with an .030 overboreand#44; an 800 CFM Edelbrock 4-barrel carburetorand#44; a matching intake manifoldand#44; MSD ignition systemand#44; and a balanced rotating assembly. Its crisply detailed with proper Pontiac Turquoise metallic paintand#44; although the air cleaner is a cool aftermarket piece. The big radiator up front keeps it cool and there are new parts throughoutand#44; ranging from the chrome alternator to the new master cylinder for the power front disc brakes. Twin Flowmaster mufflers give it a fantastic sound and weve already mentioned the transmission upgrade (this car was originally equipped with a 3-speed manual). Out back theres a 10-bolt rear with 3.55 gears on a limited slip and theres plenty of proof that this car spent its life in a warm climate. Brand new staggered (18 front; 20 rear) American Racing Torque Thrusts currently sparkle on this carand#44; but if you prefer a more subdued lookand#44; handsome Rally I wheels mounted on fresh redline radials come with the car as well.<br /> <br /> Early pony cars just dont get much better than this. 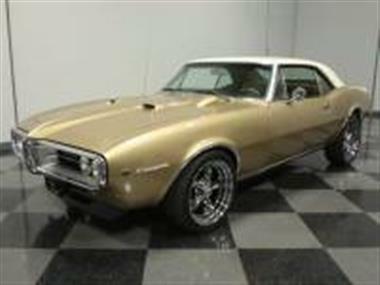 Big power in a medium-sized packageand#44; plenty of luxury featuresand#44; and a slick-shifting gearbox make this Firebird a joy to own. Call today! 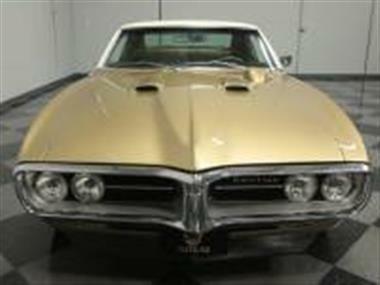 This vehicle is priced $9,807 more than the Average Market Price of $33,188 for a 1967 Pontiac Firebird. This is a Poor Deal as it's priced 23.0 % above market avg. The Pie chart below shows the number of ads within different price ranges.